Firmware 4.30/1.20 for the PXW-FS7 and PXW-FS7M2 Released. New ISO change in Cine-EI added. Sony have just released a firmware update for the PXW-FS7 and PXW-FS7 II cameras. This is a minor update with only one new feature being added which is the ability to alter the recorded ISO when shooting in the Cine-EI mode. When the camera is set to CineEI, this new function is turned on and off in the menu under System – Base Settings – Rec/Out EI Applied. When shooting normally using Cine EI, assuming that no LUT is applied to SDI1/Rec the camera always records at it’s base sensitivity (2000 ISO exposure rating) with no added gain. This is done to ensure that the cameras full dynamic range is always available and that the full recording range of either S-Log2 or S-Log3 is always available. Then the EI system is used to apply a LUT just to the viewfinder or SDI 2 for monitoring. The gain of the LUT can then be changed to provide a brighter or darker viewfinder/monitor image. For example setting the EI to 1000 EI would make the viewfinder image darker than the base setting of 2000EI by 1 stop. 2000EI and 1000EI as seen in the viewfinder with NO exposure change (image from PMW-F5, but the FS7 is more or less the same). Because you are viewing this darker image you would then open the cameras aperture by 1 stop to compensate. Opening the aperture up results in a brighter recording. 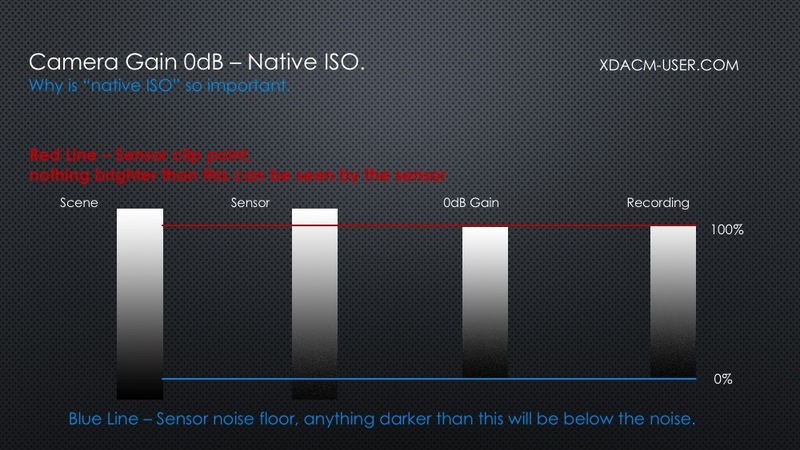 A brighter recording, achieved by putting more light onto the sensor will have less noise than a darker exposure, so the end result is brighter recorded images with less noise. This process is often referred to as “rating” the camera and it is in many cases preferable to “rate” the FS7 around a stop slower (Viewfinder is darker, less sensitive, so that means you end up opening up the aperture) than the base 2000 ISO rating to gain a cleaner image that typically gives much greater flexibility in post production. So many users will set the EI on an FS7 to 1000 or 800 (It’s no co-incidence that I find get the sweet spot to be 800EI which happens to match the rating that Sony give the FS7 when shooting Rec-709). Because in the normal EI mode there is no change to the cameras actual recording gain (the recordings take place at the equivalent of 2000 ISO) there is no change to the dynamic range. The camera will always capture 14 stops no matter what you set the EI to. However if you open the aperture by an extra stop (selecting 1000 EI, which results in a 1 stop darker viewfinder image, so to compensate you open up 1 stop) you move the mid point of the exposure up 1 stop. This means you will reduce the over exposure headroom by 1 stop but at the same time you gain one stop of under exposure range. You will see 1 stop further into the shadows, plus there will be less noise, so the shadow range becomes much more useable. Conventional EI mode and Post Production. In post production these brightly exposed images will need some degree of adjustment. If you are doing a virgin grade from scratch then you don’t really need to do anything extra or different, you will just grade it to taste. If you are using a LUT you will need to either use an exposure compensated LUT (I always provide these in any of my free LUT sets) or you will need to correct the exposure before applying the LUT. If you apply a standard LUT and then try to correct the exposure the results will often not be satisfactory as the LUT determines many things such as where any highlight roll-off occurs. Correcting after this can result in washed out of flat looking skin tones. So really you need to make the exposure correction to the material before it is passed to the LUT. No loss of dynamic range with conventional EI. It’s worth noting that even though the levels are reduced to “normal” levels when applying an exposure compensated LUT or through grading this should not reduce the dynamic range. You do not just shift the range down (which would hard clip the blacks and cause a loss of DR at the low end). What you are typically doing is reducing the gain to bring the levels down and this allows the information in the new extended shadow range to be retained, so nothing is lost and your footage will still have 14 stops of DR along with nice clean shadows and mid tones. Is this all too difficult? However, some people find that the need to correct the exposure prior to adding the LUT difficult or time consuming (I don’t know why, they just do. It takes no longer to add a compensated LUT than a normal LUT). Or some people find it difficult to get a good looking image from brightly exposed footage (probably because they are grading after the LUT has been applied). For these reasons Sony have added the ability to bake the EI change directly into the recording by shifting the gain of the recordings to match the selected EI. So now if you enable Rec/Out EI Applied any change you make to the cameras EI settings will now also be applied as a gain change to the recordings. If you set the EI to 1000, then the recordings will take place at 1000 ISO and not 2000 ISO. This means that you do not have to make any exposure corrections in post production, just apply a standard LUT. The down side to this is that you are now changing the gain of the camera. 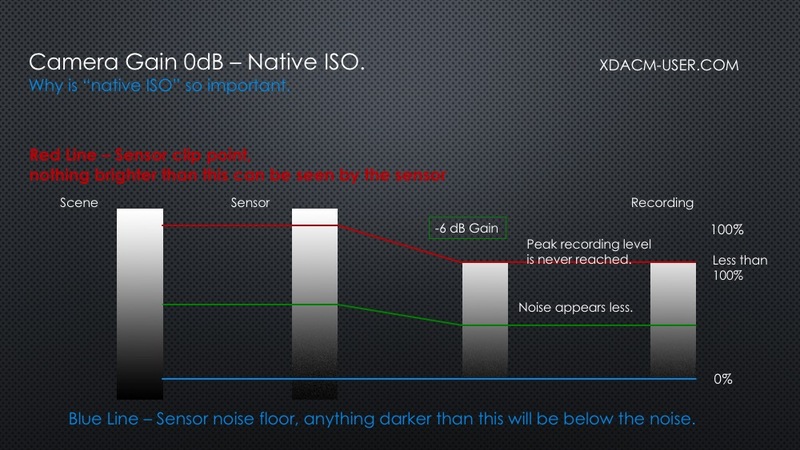 Changing the gain away from 0dB will reduce the dynamic range and affect the recording range. So, for example if you wish to shoot at 1000 EI have Rec/Out EI Applied you will be recording with -6dB gain and an effective ISO of 1000. You will have 1 stop less of shadow range as the cameras effective sensitivity is being reduced by 1 stop but the sensors clip/overload point remains the same. So when you open the aperture to compensate for the lower sensitivity you will have the same shadow range as base, but loose one stop off the top. The images will have less noise, but there will be no additional shadow information and a reduction in highlight range by 1 stop, the DR will be 13 stops. Another side effect of this is that the peak recording level is also reduced. This is because the cameras clipping point is determined by the sensor. This sensor clip point is normally mapped to the peak recording level and the cameras noise floor is mapped to the black level (you can’t see things that are darker than the sensors noise floor no matter what level of gain you use as the noise will always be higher than the object brightness). If you reduce the gain of the signal this level must decrease as a result. This means that S-Log3 which normally gets to around ~94% will now only reach ~85%, the change to S-Log2 is even greater (S-Log3’s peak recording level will reduce by 8.9% for every stop down you go, S-Log2 will reduce by 12% for each stop you go down ). 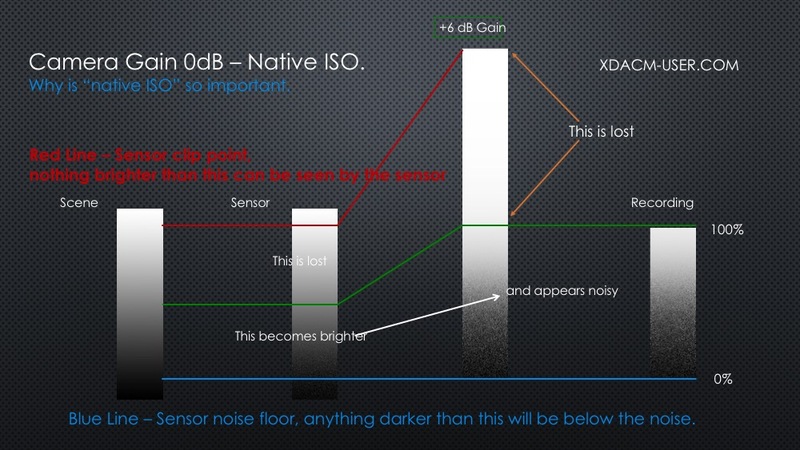 Raising the EI/ISO will also reduce the dynamic range as the gain is applied after the sensor. So the sensors clip point remains the same, so the brightest highlight it handles remains fixed. Adding gain after this simply means the recordings will clip earlier, but you will get a brighter mid range, brighter (but not more) shadows and a noisier picture. What happens in post with Rec/Out EI Applied? In post production these range and peak level changes mean that while a standard LUT will result in a correct looking mid range (because middle grey and skin tones will be at “normal” levels) there may be some problems with highlights never reaching 100% in the case of a low EI/ISO. Or being excessively clipped in the case of a high EI/ISO. Remember LUT’s are designed to work over very specific ranges. So if the input to the LUT doesn’t reach the peak level the LUT is expecting then the output from the LUT will also be reduced. So often there will still be the need to do some additional grading of highlights prior to the application of the LUT, or the need to use LUT’s designed specifically for each ISO rating (and the design of these LUT’s is more complex than a simple exposure offset). So while this new feature will simplify the workflow for some situations where an alternate ISO/EI has been used – because exposure correction in post production won’t be needed. It may actually make things more difficult if you have bright highlights or need to be sure that your finished video meets expected standards where highlights are at 100%. You will still need to do some grading. I don’t recommend that you use it. Personally I do not recommend that you use this new feature. There are plenty of exposure compensated LUT’s available online (I have lots here). Tweaking the exposure of log footage in post production isn’t that difficult, especially if you use a color managed workflow. My guess is that this is aimed at FCP-X users where FCP-X applies a default LUT as standard. In this instance footage shoot with an offset exposure will look over/under exposed while footage shoot with the EI/ISO Applied will look normal (except for the highlights). So on the face of things the workflow may appear simpler. But you are loosing dynamic range and surely the primary reason for shooting with log is to maximise the dynamic range and gain the greatest possible post production flexibility. This new feature reduces dynamic range and as a result reduces post production flexibility. Of course just because I don’t recommend it’s use, it doesn’t mean that you can’t or shouldn’t use it if it works for you, just make sure you fully understand what it is doing. Scene files for the Sony PXW-FS7M2. Here are some scene files for the PXW-FS7-II and original PXW-FS7. The first 5 scene files I published a couple of years ago but never got around to converting them over to the PXW-FS7-II. You can download the files in their correct folder structure to put on to an SD card so you can load them directly in to an FS7 or FS7-II. Or you can manually copy the settings from here. If copying the settings in manually I recommend you start by going to the “Files” section of the cameras menu and “Scene File” and import a “standard” default scene file from the cameras internal memory first to ensure you paint settings are at the original factory defaults prior to entering the settings by hand. The easiest way is to load the files linked at the bottom of the page onto an SD card and then go to the files section of the menu to load the scene files into the camera from the SD card. If you find these useful, please consider buying me a coffee or other drink. It’s always appreciated! The paint settings in for each of these setups are standard except for the items listed in each profile. Designed as a pleasing general purpose look for medium to high contrast scenes. Provides a neutral look with slightly less yellow than the standard Sony settings. I recommend setting zebras to 60% for skin tones or exposing a white card at 75-80% for the best results. Matrix: ON. Adaptive Matrix: Off. Preset Matrix: ON. Preset Select: Standard. User Matrix: ON. Level: 0. Phase: 0. R-G: +10. R-B: +8. G-R: -12. G-B: -9. B-R: -5. B-G: -15. Similar to the above except better suited to lower contrast scenes or lower light levels. Provides a neutral look with slightly less yellow than the standard Sony settings. I recommend setting zebras to 60% for skin tones or exposing a white card at 75-80% for the best results. Matrix: ON. Adaptive Matrix: Off. Preset Matrix: ON. Preset Select: Cinema. User Matrix: ON. Level: -3. Phase: 0. A high dynamic range look with film like color. Will produce a n image with more contrast than Filmlike1. Colours are tuned to be more film like with a very slight warm tint. I recommend settings zebras to 57% for skin tones and recording white at 70-75% for the most “filmic” look. These setting increase dynamic range over the standard settings but also increase the colour and vibrance. Designed to be used for when a good dynamic range and strong colours are needed direct from the camera. Suggested zebra level for skin tones is 63% and white at approx 75-80%. Matrix: ON. Adaptive Matrix: Off. Preset Matrix: ON. Preset Select: Standard. User Matrix: ON. Level: +23. Phase: -5. R-G: +12. R-B: +8. G-R: -11. G-B: -6. B-R: -6. B-G: -17. Scene File 7: AC-KODAKISH3200K (Include “Scene White Data – ON” when loading from the SD card). This is a highly experimental scene file that uses a heavily tweaked matrix along with extensive colour adjustments via the multi-matrix. The aim being to reproduce a look reminiscent of Kodak film stock. The white balance is deliberately skewed very slightly bue/teal and then skin tones and orange shades boosted. When loading this scene file from an SD card you must also set “White Data” to ON to import the offset color preset. You can then either use the preset white balance or white balance using memory A/B and a white card. Do NOT use ATW. This version is intended for use under TUNGSTEN lighting where the white balance would normally be 3200K. Please test that this profile produces a result you like before you start shooting with it as the look is quite strong and may be difficult to change later if you don’t like it. I recommend settings zebras to 57% for skin tones and recording white at 70-75% for the most “filmic” look. Matrix: ON. Adaptive Matrix: Off. Preset Matrix: ON. Preset Select: Cinema. User Matrix: ON. Level: -10. Phase: 0. R-G: +61. R-B: +29. G-R: -6. G-B: -35. B-R: +21. B-G: -5. B: Hue -18, Saturation 0. B+: Hue +5, Saturation 0. MG-: Hue +5, Saturation 0. MG: Hue +5 Saturation -7. MG+: Hue 0, Saturation -3. R: Hue -21, Saturation +65. R+: Hue +0, Saturation +99. YL: Hue 0, Saturation 0. YL+ Hue +20, Saturation -10. G-: Hue -71, Saturation 0. G: Hue -61, Saturation +10. CY: Hue -40, Saturation +9. Scene File 8: AC-KODAKISH5600K (Include “Scene White Data – ON” when loading from the SD card). This is a highly experimental scene file that uses a heavily tweaked matrix along with extensive colour adjustments via the multi-matrix. The aim being to reproduce a look reminiscent of Kodak film stock. The white balance is deliberately skewed very slightly bue/teal and then skin tones and orange shades boosted. When loading this scene file from an SD card you must also set “White Data” to ON to import the offset color preset. You can then either use the preset white balance or white balance using memory A/B and a white card. Do NOT use ATW. This version is intended for use under daylight lighting where the white balance would normally be 5600K/6000K. Please test that this profile produces a result you like before you start shooting with it as the look is quite strong and may be difficult to change later if you don’t like it. I recommend settings zebras to 57% for skin tones and recording white at 70-75% for the most “filmic” look. A hand scene file to have for shooting under mixed lights or low quality lights where there is too much green. By using a combination of the FL-Light colour matrix and a custom preset matrix this profile reduces the some problematic green colour cast that can be present. It uses Hypergamma 3 to give a more pleasing highlight roll off and increased dynamic range without reducing the low light performance. Great for office interviews! I recommend setting zebras to 62% for skin tones and recording white (white card) at between 75 and 80% for the best results. Matrix: ON. Adaptive Matrix: Off. Preset Matrix: ON. Preset Select: FL Light. User Matrix: ON. Level: 0. Phase: 0. Here are the files ready to load into you own FS7 or FS7II. Click on the link below to get to the download page where you can download a zip file with all of the scene files already in the correct folder structure to place on an SD card. Simply unzip the download and copy the “private” folder to the root of an empty SD card. These scene files have taken a lot of time and effort to develop. I offer them without charge for your own use. If you find them useful please consider buying me a coffee or other drink. To the same folder your own SD card. You can re-number the if you need to. Once the files are on an SD card insert the SD card in to the camera. Go to the “File” menu and “Scene File” and choose “Load from SD Card”. What the hell is gamma anyway – video online now. What the hell is gamma – online webinar.